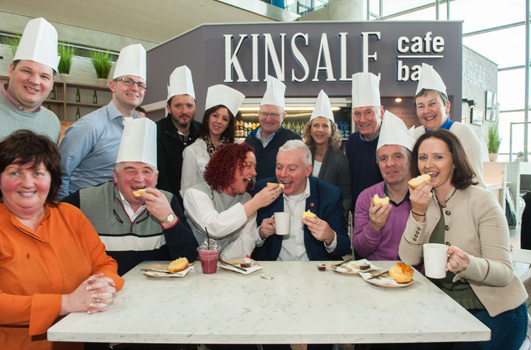 Cork Airport Managing Director Niall MacCarthy saw off top local chefs as they renewed ties with Newport in Rhode Island – which is twinned with Kinsale. It was the first time that they’ve been able to travel direct from Cork to the US, and used Norwegian‘s direct flight to Boston Providence for the annual restaurant exchange. Kinsale chefs from Actons Hotel, Trident Hotel, Jim Edwards, The Blue Haven Collection, The White House, Finn’s Table, Fishy Fishy, and The White Lady travelled to the States for the Newport Kinsale Chef Exchange. The Chairman of Kinsale Good Food Circle and current President of the Restaurant Association of Ireland, Liam Edwards, said: ‘’The purpose of the trip is to continue to strengthen the bond between Newport and Kinsale and to highlight the connectivity via Cork Airport and Providence Rhode Island. Kinsale chefs and restaurant proprietors, with Niall MacCarthy from Cork Airport, from Actons Hotel, Trident Hotel, Jim Edwards, The Blue Haven Collection, The White House, Finn’s Table, Fishy Fishy and The White Lady travelled on Norwegian Airlines to Boston Providence from Cork Airport for the Newport Kinsale Chef Exchange. Each year, chefs from Newport, Rhode Island, come to Kinsale to take part in the Kinsale Gourmet Festival in October. In turn, Kinsale chefs travel to Newport to take part in the Newport Kinsale Chef Exchange. Each Irish restaurateur will be paired with a restaurant in Newport where they will serve Irish specialities. Connect to the album here or on Facebook here.